With Equitector boots with a correctly fitted spur, it should not slip and spur rests are not needed. Some riders prefer it lower down whilst others prefer it higher up. It depends on your leg length and what discipline you do. 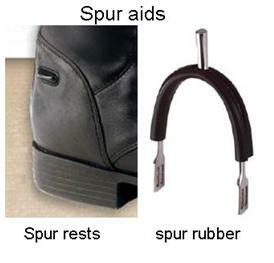 Therefore fixed spur rests in boots may be positioned too high or low down for you. This makes spur rests a hindrance rather than an aid. If your spur is slightly too wide for your boot then you can adjust these easily. Put the spur sideways on a solid surface like a kitchen top and apply steady and firm pressure with your hand. The spur will now bend to the correct width of your boot. See picture above.